This is the 1/95 Scale H.M.S. 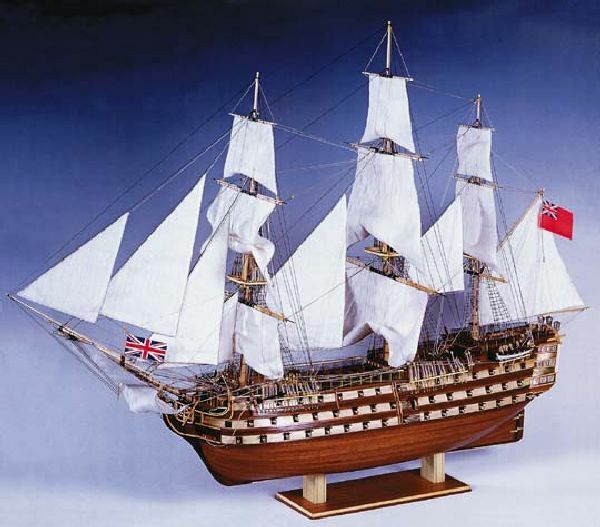 Victory Wooden Boat Kit from Constructo. The H.M.S. Victory participated under the control of Admiral Nelson in the Battle of Trafalgar on October 21, 1805 when the English defeated the French-Spanish fleet. The Victory was heavily armed with 104 cannons. It had a crew of 850 men. This vessel is totally restored, and anchored in the harbour of Portsmouth, serves as a museum. Wood planked hull and deck. Ayous, Sapelly, Mukaly, Manzonia, Beech, Boxwood, Manzonia and Anatolia wood parts. Includes yard for rigging sails, etc. INCLUDES: One H.M.S. Victory Wooden Boat Kit.